This is so easy and so refreshing. You can buy reduced balsamic, or use the following recipe. 1. If you are reducing your own balsamic, boil 1/2 cup of balsamic vinegar on low until it is reduced by about half. Add the sugar and stir until dissolved. 2. Toast the pistachios in a dry frying pan on medium low, being careful not to burn them. When cooled, chop pistachios. 3. Cut watermelon into cubes. 4. 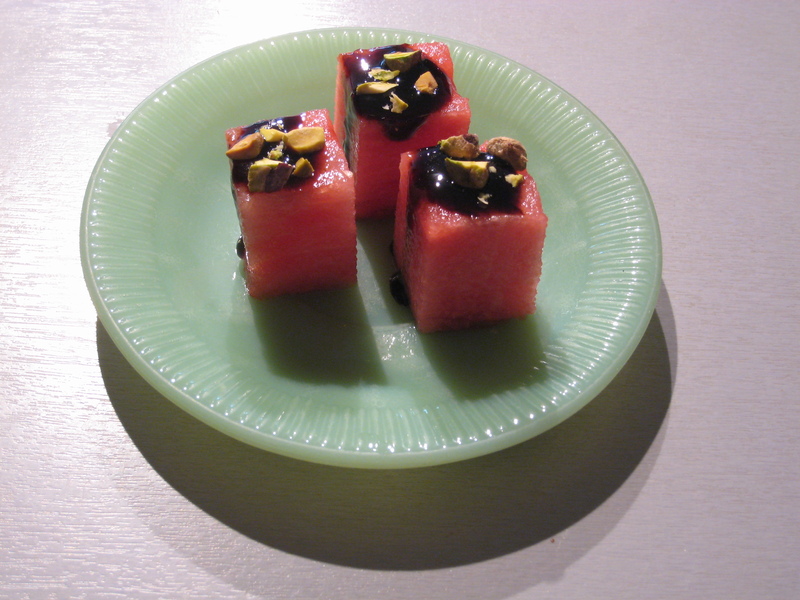 Drizzle a little of the cooled reduced balsamic on each piece of watermelon, then top with chopped pistachios.